The five spaceflyers onboard the International Space Station gathered around in festive Santa hats shortly after the Soyuz TMA-17 docked on Dec 22, 2009. 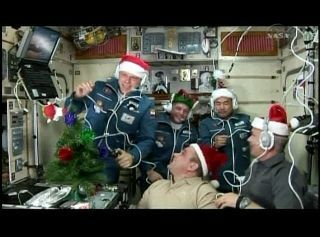 Three new spaceflyers arrived at the International SpaceStation Tuesday wearing Christmas hats and bearing holiday cheer. NASA astronaut Timothy(T.J.) Creamer, Russian cosmonaut Oleg Kotov, and Japanese astronaut SoichiNoguchi launched Sunday, and arrived at the space laboratory at 5:48 p.m. EDT(2248 GMT), and opened the hatches between the two craft at 7:30 p.m. EST (0030GMT Wednesday). Kotov floated onto the station wearing a red Santa hat andcarrying a small Christmas tree, while Noguchi floated in after him in amatching hat, with a white sack of presents hung over his shoulder. Creamerwore an elf hat (complete with pointy ears) and elf shoes. The new arrivals are joining current station commander JeffWilliams of NASA and Russian cosmonaut Maxim Suraev, who have been onboardsince October 2009. "Welcome to station guys, your home for sixmonths," Williams said to the incoming crew shortly after docking. Kotov, Noguchi and Creamer are beginning a six-month tenureat the spacestation where they will serve on the Expedition 22 and Expedition 23missions. "We look forward to having five crewmembers back onspace station, and we look forward to plenty of activities and experiments,"said Bill Gerstenmaier, associate administrator for space operations, during apost-docking news conference in Moscow. He congratulated the officials from theRussian Federal Space Agency and the Japanese Aerospace Exploration Agency, whowere also there for the event. "To get these vehicles ready to go fly and to do theactivities that you did this year is a tremendous accomplishment," hesaid. "My congratulations to you." All the station residents will get the day off Dec. 25 to sharecamaraderie and meals with one another, and to reach out to friends and familyback home through phone conversations and e-mail. After theholidays, though, it's back to work for a packed mission. In January, Kotov and Suraev are slated to don pressurizedspacesuits and perform a spacewalk, or EVA (extravehicular activity) to helpinstall the new Poisk module, which arrived at the station in November. "The primary objective of that EVA is to do all thethings necessary to integrate that new Russian module," Williams said in apreflight interview. "So that?s going to require the deployment andconnection of some cabling on the outside, primarily, and they will have somesecondary tasks as well." The mission is a significant one for Japan, whose huge Kibolaboratory was fully assembled in July. Noguchi will utilize that moduleparticularly, and its cache of research racks. He will also welcome Japanese astronaut Naoko Yamazakiaboard the station when she arrives with the visiting STS-131 space shuttlemission. It will be the first time two Japanese astronauts are in space atonce. "2009 is a big year for us," Noguchi said in apreflight interview. "I think in general the Japanese people are excitedwith all the space news these days. Hopefully that will continue in the coming year." SPACE.com is providing full coverage of the Expedition 22mission with Staff Writer Clara Moskowitz in New York. Click here for mission updates and livemission coverage.